Pansies are a low-growing annual that come in many beautiful colors. The blooms may be delicate looking, but this is a hardy plant and very cold tolerant. The pansy makes a wonderful border around your flower garden and works well in containers too. Depending on location, pansies will bloom in almost any season, creating vibrant colors and a soft look in any garden. Pansies are an easy-to-care-for plant, with bold flowers and continuous blooms. Both the leaves and flowers of pansies and violas are edible and high in vitamins A and C.
The flowers have a strong flavor and have been used to make syrup, flavored honey and salads. Both the leaves and flowers can be used as a garnish, such as on cold fruit , cream soups, and on an occasional dessert. The blooms are also useful as a dye. The pansy is a viola. The viola is a large genus containing 500 species. 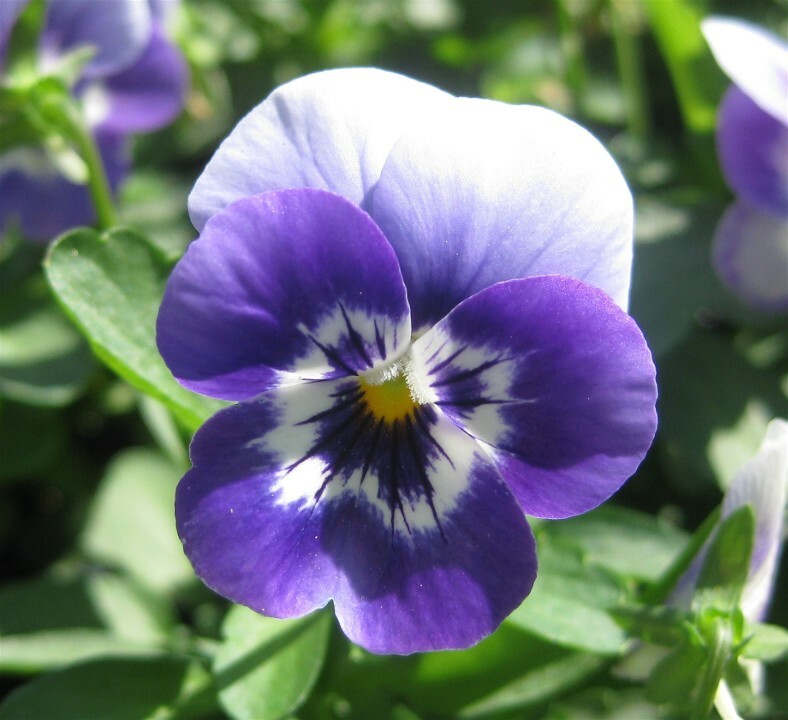 The viola family includes pansies and violets, pansies are most loved for their little "monkey-like" faces and violets for their pretty fragrance. 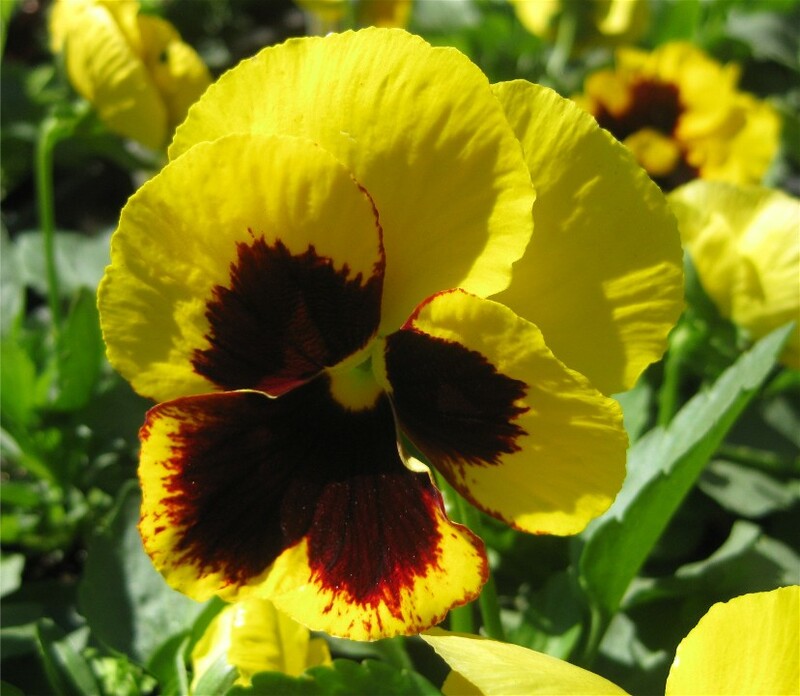 Pansy blooms are single with five petals that are rounded in shape. The flowers have one of three color patterns. Blooms can be a single, clear color, such as yellow or blue. A second pattern is a single color having black lines radiating from its center. These lines are called penciling and are similar to viola markings. The third type of flower is probably the most familiar. The bloom of this type has a dark center called a "face". Some pansies have a delicate perfume-like fragrance. Pansies seem more fragrant at early morning and dusk. The yellow or blue pansy flowers seem to have the strongest scent. Garden pansies are grown during the winter in the south and southwest and in the north during the summer. Pansy popularity is possibly due to its ease of growing. 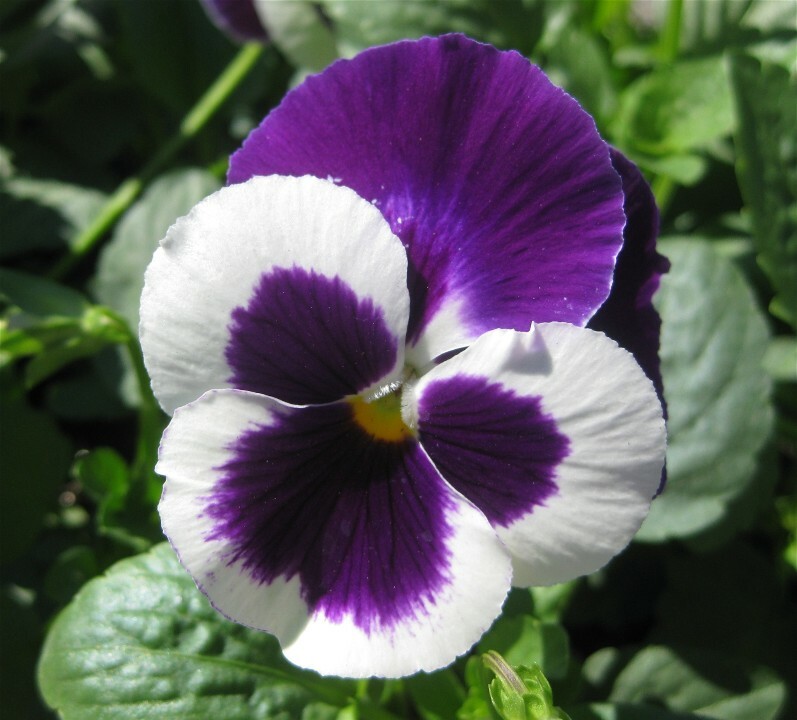 Pansies have relatively disease and pest free blooms. Choose an area that receives at least six hours of sun per day. Till the area to about 6 inches deep, removing all weeds. Add compost to the soil and mix it in well, the soil will drain better and be more nutritional to the plant. In the cooler planting zones, plant in spring when the daytime temperatures average about 60 degrees. In warmer planting zones you can plant in very early spring or early fall. Place holes 6 to 12 inches apart. Add slow-release fertilizer to the soil before back-filling around the plant. The roots should be moist when planting. The soil should be watered in around the plant. Place a little soil and water around the roots as you back-fill, this will reduce the chance of air pockets. Air pockets can cause problems for the plant later. Water the plants after planting. When watering the plants, water the ground and not the flowers or leaves. They require about an inch of water per week. It is better to water for long periods of time once a week than for shorter periods more often. Never let the plants sit in a puddle of water. Deadhead the plant (remove dead blooms) this encourages more blooms. DO PANSIES BLOOM ALL WINTER? For best performance, pansies should be planted in early fall. The better the plants can get established before winter, the better they will bloom throughout the cold months. Give them a loamy, well drained soil and at least a half day of sun. For best results, plant them in masses, spacing plants 6" apart. For bright color in the flower bed, borders, or window boxes during the winter months, nothing can match pansies! !